Genes encode proteins and proteins dictate cell function A gene is "expressed" when it is being transcribed into mRNA (and translated into protein), and there exist many cellular methods of controlling the expression of genes such that proteins are produced only when needed by the cell. The genome of a given organism contains thousands of genes, but not all these genes need to be active at any given moment. A gene is "expressed" when it is being transcribed into mRNA (and translated into protein), and there exist many cellular methods of controlling the expression of genes such that proteins are produced only when needed by the cell. Transcription factors are regulatory proteins that bind to the start of genes, either promoting or inhibiting the transcription of the gene. Differences in gene expression are especially clear within multicellular organisms, where cells contain the same genome but have very different structures and behaviors due to the expression of different sets of genes. All the cells in a multicellular organism derive from a single cell, differentiating into different cell types in response to external and intercellular signals and gradually establishing different patterns of gene expression to create different behaviors. No single gene is responsible for the development of structures within multicellular organisms, these patterns arise from the complex interactions between many cells. The expression of genes depend on chromatin structure This sequence, from right to left, shows the stages by which a long strand of DNA (deoxyribonucleic acid, far right) is combined with various proteins to form chromatin, and is then coiled and compacted to form a chromosome (far left). The intermediate stages include histone cores (blue, center right) that form 'beads on a string' and 'fiber' structures. Further scaffold proteins help coil the fiber (center left). This compaction process is required to fit DNA strands (typically 2 meters in length) inside cell nuclei (less than 0.1 millimeters across). The scale in nanometers (nm) is across top. The expression of genes is influenced by the chromatin structure of a chromosome and regions that have low or no gene expression usually contain high levels of methylation of cytosine bases. For example, cytosine methylation, producing 5-methylcytosine, is important for X-chromosome inactivation. The structural proteins in chromosomes organize the DNA within chromosomes into a compact structure called chromatin. This structure involves DNA binding to a complex of small basic proteins called histones. The histones form a disk-shaped complex called a nucleosome, which contains two complete turns of double-stranded DNA wrapped around its surface. These non-specific interactions are formed through basic residues in the histones making ionic bonds to the acidic sugar-phosphate backbone of the DNA, and are therefore largely independent of the base sequence. Chemical modifications of these basic amino acid residues include methylation, phosphorylation and acetylation. These chemical changes alter the strength of the interaction between the DNA and the histones, making the DNA more or less accessible to transcription factors and changing the rate of transcription. Replication protein A is one of these proteins essential for most processes where the double helix is separated, including DNA replication, recombination and DNA repair. Proteins also specifically bind to particular set of DNA sequences and hence regulate transcription by activating or inhibiting the transcription of genes. These proteins can bind the RNA polymerase responsible for transcription, and locate the polymerase at the promoter to begin transcription. Transcription factors sometimes bind enzymes that modify the histones at the promoter; change the accessibility of the DNA template to the polymerase, there by regulating transcription. Transcription factor-DNA, molecular model. Transcription factors are proteins that control which genes are turned on or off in the genome. As these DNA targets can occur throughout an organism's genome, changes in the activity of one type of transcription factor can affect thousands of genes. Consequently, these proteins are often the targets of the signal transduction processes that mediate responses to environmental changes or cellular differentiation and development. The specificity of these transcription factors' interactions with DNA come from the proteins making multiple contacts to the edges of the DNA bases. In the adjacent figure, a strand of DNA (deoxyribonucleic acid, yellow) is being acted on by a transcription factor protein (red and green). Transcription factors bind to DNA during a process called transcription, where the DNA is converted to RNA (ribonucleic acid), which will then be translated into a protein product. This transcription factor is for FOXP2 (for head box protein P2), which plays a role in brain and lung development. In humans, mutations of FOXP2 cause speech and language disorders. This is a solid surface representation of the FOXP2 structure. Sequential steps in gene expression Gene expression is the process by which information from a gene is used in the synthesis of a functional gene product. These products are often proteins, but in non-protein coding genes such as ribosomal RNA (rRNA), transfer RNA (tRNA) or small nuclear RNA (snRNA) genes, the product is a functional RNA. Genes generally express their functional effect through the production of proteins, which are complex molecules responsible for most functions in the cell. Proteins are chains of amino acids, and the DNA sequence of a gene (through an RNA intermediate) is used to produce a specific protein sequence. 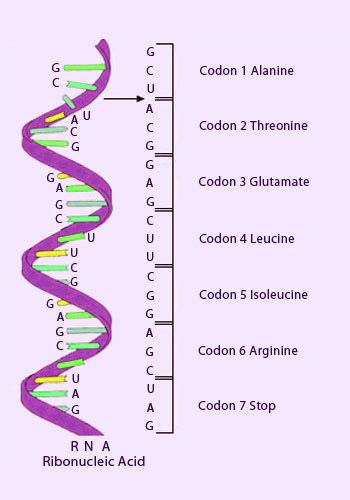 Each group of three nucleotides in the sequence, called a codon, corresponds to one of the twenty possible amino acids in protein - this correspondence is called the genetic code. The flow of information is unidirectional: information is transferred from nucleotide sequences into the amino acid sequence of proteins, but never from protein back into the sequence of DNA - a phenomenon Francis Crick called the central dogma of molecular biology. The specific sequence of amino acids results in a unique three-dimensional structure for that protein, and the three-dimensional structures of protein are related to their function. Some are simple structural molecules, like the fibers formed by the protein collagen. An overview of transcription and translation mechanism The protein synthesis occurs by means of transcription (in the nucleus: production of RNA with nitrogenous bases that are complementary to one of the DNA strands) and translation (in polyribosomes and the rough endoplasmatic reticulum both located in the cytoplasm: RNA codes specific chains of aminoacids, i.e. polypeptide, the precursors of proteins). Proteins are involved in all vital functions in cells, including enzymatic catalyzation, transport, storage, movement, support, signaling, defense and control. Proteins can bind to other proteins and simple molecules, sometimes acting as enzymes by facilitating chemical reactions within the bound molecules (without changing the structure of the protein itself). Protein structure is dynamic; the protein hemoglobin bends into slightly different forms as it facilitates the capture, transport, and release of oxygen molecules within mammalian blood. A single nucleotide difference within DNA can cause a single change in the amino acid sequence of a protein. Because protein structures are the result of their amino acid sequences, some changes can dramatically change the properties of a protein by destabilizing the structure or changing the surface of the protein in a way that changes its interaction with other proteins and molecules. For example, sickle-cell anemia is a human genetic disease that results from a single base difference within the coding region for the ß-globin section of hemoglobin, causing a single amino acid change that changes hemoglobin's physical properties. Sickle-cell versions of hemoglobin stick to themselves, stacking to form fibers that distort the shape of red blood cells carrying the protein. These sickle-shaped cells no longer flow smoothly through blood vessels, having a tendency to clot or degrade, causing the medical problems associated with the disease. The dynamic structure of hemoglobin is responsible for its ability to transport oxygen within mammalian blood and a single amino acid change causes hemoglobin to form fibers. A single-stranded RNA molecule illustrating the position of three-base codons. The genetic code consists of 64 triplets of nucleotides. These triplets are called codons. 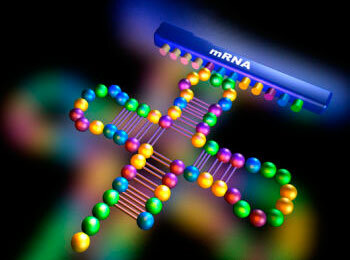 DNA, through a messenger RNA intermediate, codes for protein with a triplet code. The genetic code is the set of rules by which a gene is translated into a functional protein. 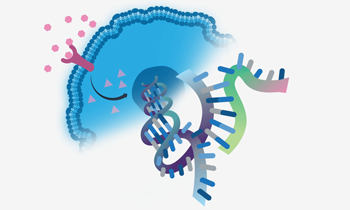 Each gene consists of a specific sequence of nucleotides encoded in a DNA (or sometimes RNA) strand; a correspondence between nucleotides, the basic building blocks of genetic material, and amino acids, the basic building blocks of proteins, must be established for genes to be successfully translated into functional proteins. Sets of three nucleotides, known as codons, each correspond to a specific amino acid or to a signal . There are 64 possible codons (four possible nucleotides at each of three positions, hence 43 possible codons) and only 20 standard amino acids; hence the code is redundant and multiple codons can specify the same amino acid. The correspondence between codons and amino acids is nearly universal among all known living organisms. Three codons known as "stop codons" instead of specifying a new amino acid, alert the translation machinery that the end of the gene has been reached. The genetic code is the set of rules by which information encoded in genetic material (DNA or mRNA sequences) is translated into proteins (amino acid sequences) by living cells. The code defines how sequences of three nucleotides, called codons, specify which amino acid will be added next during protein synthesis. With some exceptions, a three-nucleotide codon in a nucleic acid sequence specifies a single amino acid. Because the vast majority of genes are encoded with exactly the same code, this particular code is often referred to as the standard genetic code, or simply the genetic code, though in fact some variant codes have evolved. For example, protein synthesis in human mitochondria relies on a genetic code that differs from the standard genetic code. Not all genetic information is stored using the genetic code. All organisms' DNA contains regulatory sequences, intergenic segments, chromosomal structural areas, and other non-coding DNA that can contribute greatly to phenotype. Those elements operate under sets of rules that are distinct from the codon-to-amino acid paradigm underlying the genetic code. Sequential steps in protein biosynthesis Protein synthesis is accomplished through a process called translation. After DNA is transcribed into a messengerRNA (mRNA) molecule during transcription, the mRNA must be translated to produce a protein. In translation, mRNA along with transfer RNA (tRNA) and ribosomes work together to produce proteins. Genes do not build a protein directly but provide the instructions for making specific proteins. Genes are typically hundreds or thousands of nucleotides long and each gene has a specific sequence of bases. Each protein has its own unique amino acid sequence that is specified by the nucleotide sequence of the gene encoding this protein. The genetic code is a set of three-nucleotide sets called codons and each three-nucleotide combination stands for an amino acid, for example AUG stands for methionine. So we can describe the flow of information in linguistic terms as both DNA and proteins contain information written in two different chemical languages (sequence of nucleotides/amino acids). The flow of information from gene to protein is based on a triplet code and the genetic instructions for a polypeptide chain are written in the DNA as a series of non overlapping, three-nucleotide words. For example, the base triplet AGT at a particular position along a DNA strand results in the placement of the amino acid serine at the corresponding polypeptide to be produced. Codons are the triplets of nucleotide bases that code the amino acids and there are 64 possible code words - enough to specify all the amino acids. Thus, protein biosynthesis is the process in which cells build or manufacture proteins. The term is sometimes used to refer only to protein translation but more often it refers to a multi-step process, beginning transcription of nuclear DNA into messenger RNA, which is then used as input for translation. In protein synthesis, a succession of tRNA molecules charged with appropriate amino acids are brought together with an mRNA molecule and matched up by base-pairing through the anti-codons of the tRNA with successive codons of the mRNA. The amino acids are then linked together to extend the growing protein chain, and the tRNAs, no longer carrying amino acids, are released. This whole complex of processes is carried out by the ribosome - formed of two main chains of RNA - called ribosomal RNA (rRNA), and more than 50 different proteins. Transcribing the genetic information from DNA to RNA Transcription is the process by which an RNA strand is formed that is complementary to the DNA that it copied. The process of genetic transcription produces a single-stranded RNA molecule known as messenger RNA, whose nucleotide sequence is complementary to the DNA from which it was transcribed. The DNA strand whose sequence matches that of the RNA is known as the coding strand and the strand from which the RNA was synthesized is the template strand. Transcription is performed by an enzyme called as an RNA polymerase, which reads the template strand in the 3' to 5' direction and synthesizes the RNA from 5' to 3'. To initiate transcription, the polymerase first recognizes and binds a promoter region of the gene. Thus a major mechanism of gene regulation is the blocking or sequestering of the promoter region, either by tight binding by repressor molecules that physically block the polymerase, or by organizing the DNA so that the promoter region is not accessible. In prokaryotes, transcription occurs in the cytoplasm; for very long transcripts, translation may begin at the 5' end of the RNA while the 3' end is still being transcribed. In eukaryotes, transcription necessarily occurs in the nucleus, where the cell's DNA is sequestered; the RNA molecule produced by the polymerase is known as the primary transcript and must undergo post-transcriptional modifications before being exported to the cytoplasm for translation. 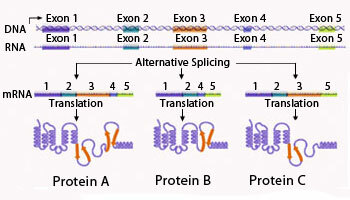 The splicing of introns present within the transcribed region is a modification unique to eukaryotes; alternative splicing mechanisms can result in mature transcripts from the same gene having different sequences and thus coding for different proteins. This is a major form of regulation in eukaryotic cells. 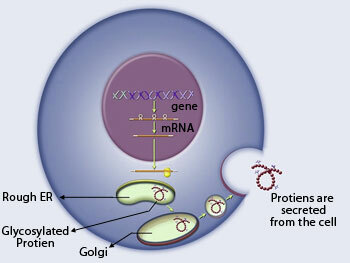 Typical eukaryotic protein-coding gene Promoters and enhancers determine what portions of the DNA will be transcribed into the precursor mRNA (pre-mRNA). Promoters and enhancers determine what portions of the DNA will be transcribed into the precursor mRNA (pre-mRNA). The pre-mRNA is then spliced into messenger RNA (mRNA) which is later translated into protein. All genes have regulatory regions in addition to regions that explicitly code for a protein or RNA product. 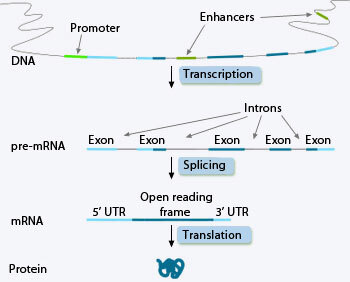 A regulatory region shared by almost all genes is known as the promoter, which provides a position that is recognized by the transcription machinery when a gene is about to be transcribed and expressed. Although promoter regions have a consensus sequence that is the most common sequence at this position, some genes have "strong" promoters that bind the transcription machinery well, and others have "weak" promoters that bind poorly. 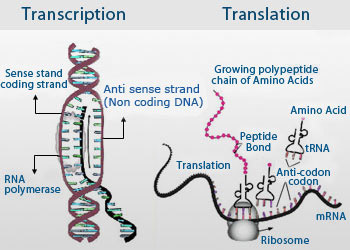 These weak promoters usually permit a lower rate of transcription than the strong promoters, because the transcription machinery binds to them and initiates transcription less frequently. Other possible regulatory regions include enhancers, which can compensate for a weak promoter. Most regulatory regions are "upstream" - that is, before or toward the 5' end of the transcription initiation site. Eukaryotic promoter regions are much more complex and difficult to identify than prokaryotic promoters. Splicing of introns resulting a functional gene For most eukaryotic genes, the initial RNA that is transcribed from a gene's DNA template must be processed before it becomes a mature messenger RNA (mRNA) that can direct the synthesis of protein. One of the steps in this processing, called RNA splicing or intron splicing, involves the removal or "splicing out" of certain sequences referred to as intervening sequences, or introns. 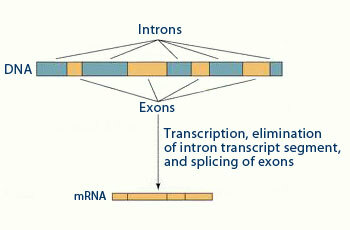 The final mRNA thus consists of the remaining sequences, called exons, which are connected to one another through the splicing process. Many prokaryotic genes are organized into operons, or groups of genes whose products have related functions and which are transcribed as a unit. By contrast, eukaryotic genes are transcribed only one at a time, but may include long stretches of DNA called introns which are transcribed but never translated into protein (they are spliced out before translation). Splicing can also occur in prokaryotic genes, but is less common than in eukaryotes. Genes consist of a long strand of DNA that contains a promoter, which controls the activity of a gene, and coding and non-coding sequences. Coding sequence determines what the gene produces, while non-coding sequence can regulate the conditions of gene expression. When a gene is active, the coding and non-coding sequence is copied in a process called transcription, producing an RNA copy of the gene's information. This RNA can then direct the synthesis of proteins via the genetic code. However, RNAs can also be used directly, for example as part of the ribosome. These molecules resulting from gene expression, whether RNA or protein, are known as gene products. Mechanism of Intron splicing The genes of eukaryotic organisms contain regions called introns that are removed from the messenger RNA in a process called splicing. Genes often contain regions that do not encode products, but regulate gene expression. The genes of eukaryotic organisms can contain regions called introns that are removed from the messenger RNA in a process called splicing. The regions encoding gene products are called exons. In eukaryotes, a single gene can encode multiple proteins, which are produced through the creation of different arrangements of exons through alternative splicing. In prokaryotes (bacteria and archaea), introns are less common and genes often contain a single uninterrupted stretch of DNA, called a cistron, that codes for a product. Prokaryotic genes are often arranged in groups called operons with promoter and operator sequences that regulate transcription of a single long RNA. This RNA contains multiple coding sequences. Each coding sequence is preceded by a Shine-Dalgarno sequence that ribosomes recognize. RNA's known as ribozymes are capable of enzymatic function, and miRNA have a regulatory role. Ribozyme enzyme cleaving mRNA (messenger ribonucleic acid). The ribozyme is cleaving the mRNA, blocking protein synthesis. RNA is an intermediate product in the process of manufacturing proteins from genes but for some of the gene sequences, the RNA molecules are the actual functional products. For example, RNAs known as ribozymes are capable of enzymatic function, and miRNAs have a regulatory role. The DNA sequences from which such RNAs are transcribed are known as non-coding DNA, or RNA genes. Some viruses store their entire genomes in the form of RNA, and contain no DNA at all. Because they use RNA to store genes, their cellular hosts may synthesize their proteins as soon as they are infected and without the delay in waiting for transcription. On the other hand, RNA retroviruses, such as HIV, require the reverse transcription of their genome from RNA into DNA before their proteins can be synthesized. Genetic translation This process uses genetic information to direct the synthesis of proteins. The main molecules involved are two types of RNA (ribonucleic acid). 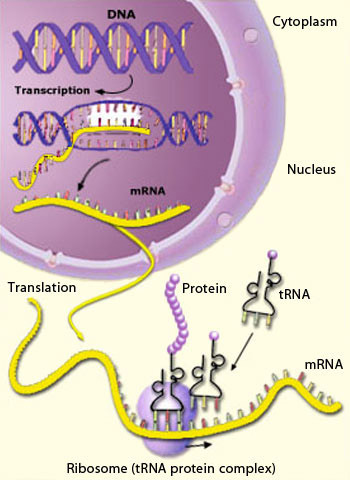 mRNA (messenger RNA, top right) carries a working copy (transcript) of the information in the relevant gene. Genes comprise a sequence of nucleotide triplets (codons), each coding for an amino acid. tRNAs (transfer RNA, cloverleaf shape) each carry a single amino acid (not shown) and have an anticodon loop which binds to the corresponding codon (upper right). A sequence of codons is thus translated to a sequence of amino acids, which are joined to make a protein. 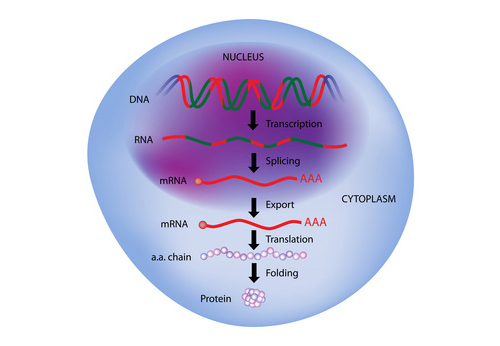 Translation is the process by which a mature mRNA molecule is used as a template for synthesizing a new protein. Translation is carried out by ribosomes, which are large complexes responsible for carrying out the chemical reactions to add new amino acids to a growing polypeptide chain by the formation of peptide bonds. The genetic code is read three nucleotides at a time, in units called codons, via interactions with specialized RNA molecules called transfer RNA (tRNA). Each tRNA has three unpaired bases known as the anticodon that are complementary to the codon it reads; the tRNA is also covalently attached to the amino acid specified by the complementary codon. When the tRNA binds to its complementary codon in an mRNA strand, the ribosome ligates its amino acid cargo to the new polypeptide chain, which is synthesized from amino terminus to carboxyl terminus. During and after its synthesis, the new protein must fold to its active three-dimensional structure before it can carry out its cellular function. During transcription, the gene determines the sequence of bases along the length of an mRNA molecule. For each gene, only one of the two DNA strands is transcribed. This strand is called the template strand because it provides the template for ordering the sequence of nucleotides in an RNA transcript. A given DNA strand can be the template strand for some genes, while for other genes in other regions, the complementary strand may function as the template. Note, however, that for a given gene, the same strand is used as the template every time it is transcribed. The bridge between DNA and protein synthesis is the RNA which is chemically similar to DNA, except that it contains ribose instead of deoxyribose as its sugar and has the nitrogenous base uracil rather than thymine. Thus, each nucleotide along a DNA strand has A, G, C, or T as its base, and each nucleotide along an RNA strand has A, G, C, or U as its base. 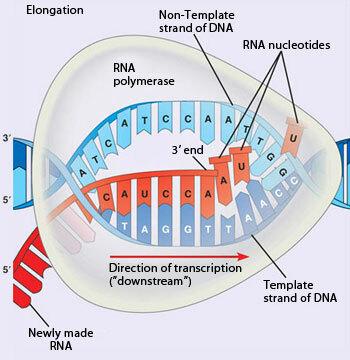 Transcription is the synthesis of RNA under the direction of DNA. Both nucleic acids use the same language and the information is simply transcribed, or copied, from one molecule to the other. Just as a DNA strand provides a template for the synthesis of a new complementary strand during DNA replication, it provides a template for assembling a sequence of RNA nucleotides. The resulting RNA molecule is a faithful transcript of the gene's protein-building instructions which is called messenger RNA (mRNA), because it carries a genetic message from the DNA to the protein-synthesizing machinery of the cell. Flawless protein production Translation is the process by which a mature mRNA molecule is used as a template for synthesizing a new protein. Genes encoded in DNA are transcribed into messenger RNA by proteins such as RNA polymerase, which are then used as a template for protein synthesis by the ribosome. In eukaryotes the messenger RNA(mRNA) is made in the cell nucleus which moves across the nuclear membrane into the cytoplasm, where protein synthesis takes place. The process of synthesizing a protein from an mRNA template is known as translation, where the base sequence of an mRNA molecule is translated into the amino acid sequence of a polypeptide. 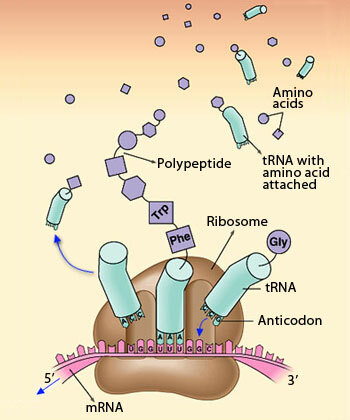 The sites of translation are ribosomes, complex particles that facilitate the orderly linking of amino acids into polypeptide. 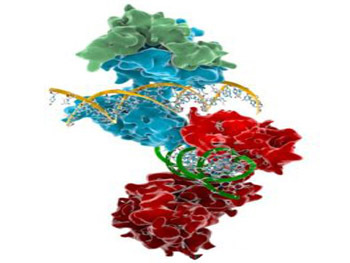 Ribosomes enable protein biosynthesis by translating RNA into protein. The mRNA comprises a series of codons that dictate to the ribosome the sequence of the amino acids needed to make the protein. The ribosome traverses each codon of the mRNA, pairing it with the appropriate amino acid by using molecules of transfer RNA(tRNA) containing a complementary anticodon on one end and the appropriate amino acid on the other. The mRNA provides protection for the genetic information in DNA by using the copied information of DNA for protein synthesis while retaining the original information in DNA. Further, using an RNA intermediate allows more copies of a protein to be made simultaneously, since many RNA transcripts can be made from one gene and each RNA transcript can be translated repeatedly. Oxytocin receptors modulate a variety of behaviors It includes stress and anxiety, social memory and recognition, bonding (affiliation) and maternal behavior. Gene expression is one of the most tightly controlled processes in the body. This process needs to be strictly regulated to ensure that cells produce the correct amount of proteins when they need them. Any disruption to this regulation can lead to serious consequences, including cancer. 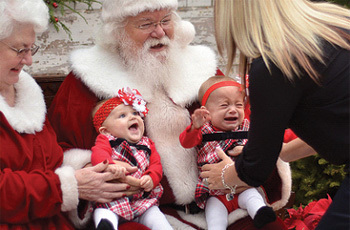 The product arising out of the expression of one gene may turn up the expression of another, which suppresses the expression of a third and so on. External factors like education, food, conflict or love may enter right in the middle of this network to influence the so called thermostats on the fronts of genes which affect the timing. We can see nurture express itself through nature. Genes are the means by which nurture expresses itself, just as they are means by which nature expresses itself. For example; the oxytocin receptors expressed in the medial amygdala fire up the dopamine system with sensations of personal addiction towards the loved one and hence pair-bonding instinct is manifest in oxytocin receptor genes. Let’s explore more examples further. A genetic mechanism may be responsible for some people being naturally happy while others sink into depression, it was revealed recently by geneticists. Scientists have discovered two versions of an enzyme which controls levels of the mood chemical serotonin in the brain. The serotonin transporter gene (5-HTTLPR) is called "happiness gene" as variation in the promoter region of this gene influences the feeling of happiness. Serotonin is a neurotransmitter, a chemical used to transmit messages between neurons. It has a profound effect on many behavioral and physiological functions, including mood, emotion, sleep and appetite. Humans are likely to possess the enzyme, depending on their genetic make-up, say the scientists. The differences could help explain why some individuals are naturally positive and happy while others are prone to depression. Low levels of serotonin have been implicated in many disorders including clinical depression, anxiety, post-traumatic stress disorder and attention deficit hyperactivity disorder (ADHD). Tumor suppressor gene mutations and deletions result in loss of growth inhibitory pathways. 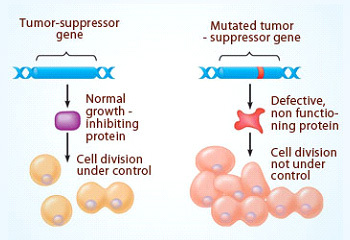 A tumor suppressor gene, or anti-oncogene, is a gene that protects a cell from one step on the path to cancer. When this gene is mutated to cause a loss or reduction in its function, the cell can progress to cancer, usually in combination with other genetic changes. The p53–Mdm2 paradigmThe affair between Mdm2 and p53 is closely controlled by a complex array of post-translational modifications, which in turn dictates the stability and activity of p53 and Mdm2. P53 (Tumor suppressor gene/TP53) is a gene that codes for a protein that regulates the cell cycle and hence functions as tumor suppression. It is very important for cells in humans to suppress cancer. Hence, p53 has been referred as “the guardian of the genome”, describing its role in conserving stability by preventing genome mutation. P53 plays a pivotal role in controlling the mechanisms of cell cycle and apoptosis (programmed cell death). If the p53 gene is mutated, ie; defective p53 could allow abnormal cells to proliferate/divide make them double, resulting in cancer. It is estimated through the recent studies, that 50% of all human tumors contain p53 mutants.In normal cells, the p53 protein level is low. DNA damage and other stress signals may trigger the increase of p53 proteins, which have three major functions – growth arrest, DNA repair and apoptosis. The growth arrest stops the progression of cell cycle, preventing replication of damaged DNA. During the growth arrest, p53 may activate the transcription of proteins involved in DNA repair. Apoptosis is the "last resort" to avoid proliferation of cells containing abnormal DNA. The cellular concentration of p53 must be tightly regulated. While it can suppress tumors, high level of p53 may accelerate the aging process by excessive apoptosis. 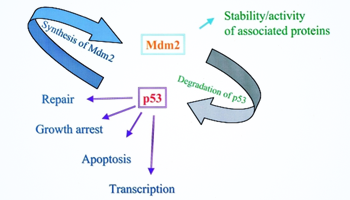 The major regulator of p53 is Mdm2, which can trigger the degradation of p53. The murine double minute 2 (mdm2) gene encodes a negative regulator of the p53 tumor suppressor. Amplification of mdm2 or increased expression by unknown mechanisms occurs in many tumors. Thus, increased levels of MDM2 would inactivate the apoptotic and cell cycle arrest functions of p53, as do deletion or mutation of p53, common events in the genesis of many kinds of tumors. p53 is a transcriptional activator, regulating the expression of Mdm2 (for its own regulation) and the genes involved in growth arrest, DNA repair and apoptosis. Some important examples are listed below. Growth arrest: p21, Gadd45, and 14-3-3s. Apoptosis: Bax, Apaf-1, PUMA and NoxA. Thus, it is with the expression of tumor suppressor gene that helps cell division, growth and other cellular activities necessary for the proper functioning of our body. If the gene doesn’t express properly, the body develop tumors. ', Insulin-regulated expression Insulin regulates the expression of more than 150 genes, indicating that this is a major action of this hormone. Defective regulation of gene expression may be involved in the pathogenesis of type 2 diabetes. 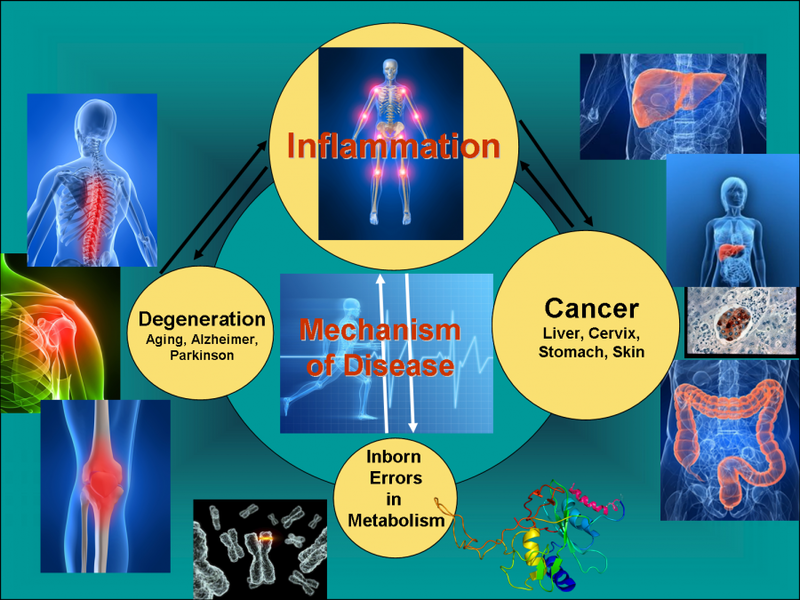 Chronic inflammatory diseases are related to abnormal gene expressionA number of human diseases are the result from the absence or malfunction of transcription factors and the disruption of gene expression caused. Common human diseases result from the interplay of many genes and environmental factors. The genetics of variation in gene expression, or genetical genomics, has attracted significant interest in the last decade, with many studies characterizing its genetic architecture. Control and regulation of insulin expression to safeguard blood glucose level and the control of cyclin expression to ensure normal progression of the cell cycle are the two common examples of gene expression regulation. Gene regulation determines the cell’s overall structure and function, governing cell differentiation, cell proliferation, cell morphology and the cell’s adaptability to its environment. In addition, several studies have demonstrated the potential causal impact of differential gene expression on complex disease risk. Diseases such as Chronic inflammatory diseases like inflammatory bowel disease (IBD), Chron’s disease, Ulcerative colitis, psoriasis and rheumatoid arthritis stratify the diseases based on gene expression changes, scientists say. These chronic diseases have common features such as the autoimmune origin, the frequent co-morbidity and a few genes such as as IL10, IL23R, SLC22A4 and SLC22A5 that have been identified as contributors to their genetic background. However their prevalence and the tissues affected are clearly different. Thus, a number of human diseases are known to result from the absence or malfunction of transcription factors and the disruption of gene expression thus caused.